Published: December 11, 2015 10:43 Farah Ahmed, Special to tabloid! 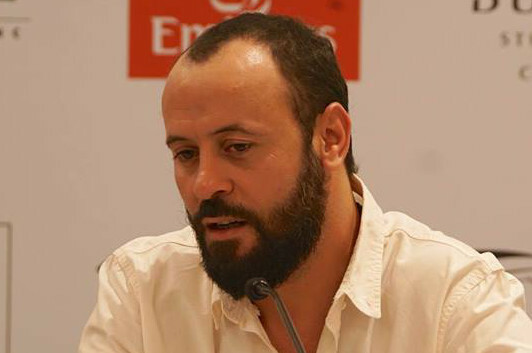 Ali Suliman was first introduced to the audience as Khaled in Hani Abu Asaad’s Golden Globe-winning film Paradise Now. After this huge breakthrough, Suliman has appeared in significant roles such as a lawyer Zaid Daud in Lemon Tree and surgeon Amin Jaafari in The Attack. Now we see him in another unique role as a psychopathic policeman Dbaan in Majid Al Ansari’s Zinzana. Suliman plays a visiting officer who forces Talal (Saleh Bakri), a prisoner, to pretend to be a mad man to save his family’s life. After its first Dubai screening on Thursday at the 12th edition of the Dubai International Film Festival, the film will now be in cinemas across the UAE. Here’s what he had to say in a chat with tabloid! What differentiates your role in Zinzana from your previous ones in cinema? It is a very nice, funny and complicated character. My character in Zinzana has many unique qualities that never existed in any character I have played before. What attracted you in Dbaan’s character that led to you accepting the role? Zinzana introduces in the Arab region a new genre which is known as the psychological thriller. I think this is a great step in Arab cinema and the film is a gateway to many Arab films that carry the same genre. What difficulties did you face during the shooting of this film? The filming in one location and in chronological sequence was very challenging. At the beginning of shooting the chronological order really helped in developing the character, but the last two weeks of shooting where really hard, especially my end scenes where my character is burned. I had to sit for almost three hours in make-up as a mask was prepared for my face. It was really difficult for me to see and hear anyone or interact with the crew, the director and the actors. I want to play every nice and new role. I want to play a role that challenges me but I should also enjoy playing it. There are not many characters that can give me that challenge and to say ‘Wow, I want to live the character to the last bit’. How do you see the future of Palestinian cinema? The fact that there are nine Palestinian films participating this year in Diff says a lot. I am very optimistic and proud. Palestinian cinema is a way of resistance and it also shows that we Palestinians love life and art. In previous years, the Palestinian cinema was not very active but now we have a talented new generation that can take over the platform. I think Diff is a great step towards encouraging the Arab cinema and Palestinian cinema in particular. My next project is The Worthy directed by Emirati director Ali Mostafa and produced by Image Nation Abu Dhabi, it is going to be released next year. — Farah Ahmed is an intern at Gulf News.